I do love the Summer holidays but always worry about how expensive it can be keeping your children entertained, especially on rainy days. I am always on the look out for fun activities and adventures for us to take part in that won't cost the earth. When I heard about Nick Jr.'s Sing-along Summer with Dora, I immediately knew it would be something Heidi and Jack would enjoy. If you tune into Nick Jr this Summer every day between 10am-1pm you will find that your children's favourite shows will have been given a makeover to include on-screen karaoke lyrics to all of their songs. Children will be able to sing-along with Dora and Friends: Into the City!, Wallykazam and more - this is perfect for lazy mornings in the house and I know I will be popping Nick Jr on whilst I prepare the children's lunch to guarantee no interruptions! 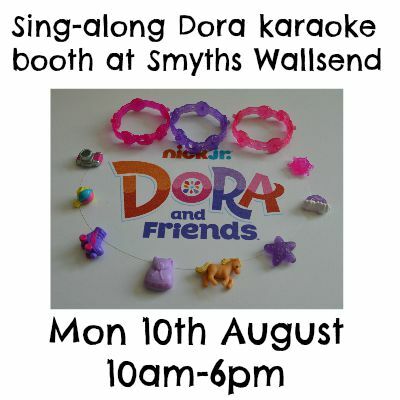 A special Dora Sing-Along karaoke booth is touring the Country and will be appearing at Smyths toy store in Wallsend on Monday 10th August between 10am-6pm. Children (and grown ups if you like) will have the chance to create videos of themselves singing along to Dora and Friends: Into the City theme tune in the booth and then enter them into a special Nick Jr competition where you could win the chance for your video to appear on Nick Jr. 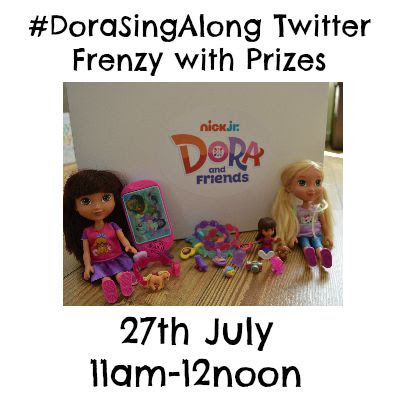 Grown ups can also take part in the #DoraSingAlong Twitter Frenzy on Monday 27th July 11am-midday - simply tweet along during the hour using #DoraSingAlong for your chance to win some fabulous Dora prizes. These dolls are very good value for money - priced at £10.99 each they come withe their own adventure charm which can be attached to any Fisher-Price Dora and Friends charm bracelet (see below). Heidi has loved taking care of her two dolls and taking them on lots of mini adventures. For £7.99 you will receive a bracelet and three adventure charms to wear or share with your friends. Heidi has surprisingly taken good care of these so far and has enjoyed changing the charms around on her bracelet. You will also receive a mini Dora figure. I think this would make the perfect gift for a little girl from their friend and they could swap and share charms. This bracelet is designed to recreate the adventures of the Dora and Friends television show. The set also includes two smaller bracelets and six additional charms you can share with friends. I do like that you get a fair bit included in this set however after 3 days the stickers have already started peeling off which isn't great. This was probably Heidi's favourite Dora toy that she was sent - it looks just like Dora's from the TV show and and you can press the screen for various (play) functions such as receive incoming calls and voicemail from Dora and Friends, use the Map App and pretend to take photographs of friends. It is also bilingual with lots of songs and phrases. Definitely good value. We've had lots of fun already with Dora and can't wait to visit Smyths on 10th August to make our own video. 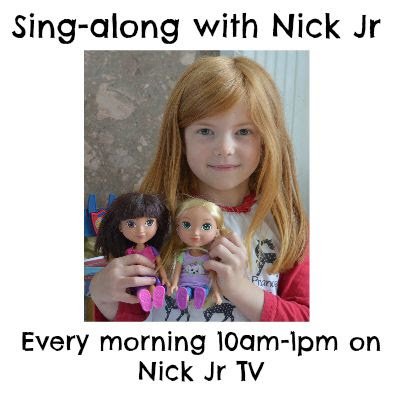 Don't forget to practice the lyrics by watching Nick Jr every morning from 10am and I hope to see some of you joining in with the twitter party too - fingers crossed you win some fab prizes. Your girls is too gorgeous! I'm so excited for the kids having a turn at the sing a long !